Pimarc project management software was created by PRL Info Systems in response to the real world information needs of a land survey company in London, Ontario. Holstead & Redmond has been in operation for over 50 years and works on a daily basis with engineers, architects and construction companies. It was the relationship between each of these types of companies that influenced Pimarc’s design and helped shape the final software suite. Because of a company that needed to better manage and access a large and growing survey record index (SRI), this software was created. 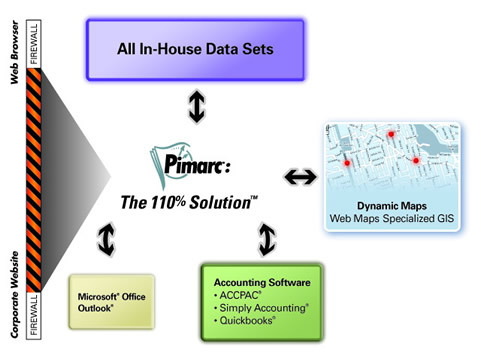 From Pimarc’s initial concept, the software was expanded and refined until it was made commercially available in 2004. It was met with praise from land surveying, engineering and architect companies who were facing similar challenges and needed a broad solution. Holstead & Redmond continues to serve as Pimarc’s “live laboratory” and is where all new software features and enhancements are tested before going live to the public. This type of testing atmosphere ensures that the Pimarc software products are continuing to meet the evolving needs of the people who use it. Currently, Pimarc’s software products are used by professionals in Canada and the USA across many industries, including architects, engineers, land surveyors, contractors and more. Please review how PRLINFO SYSTEMS has helped other types of companies streamline their workflow and reduce duplication. Each of Pimarc’s software applications are secure and web-based, allowing it to integrate seamlessly with numerous other software applications and data sets.